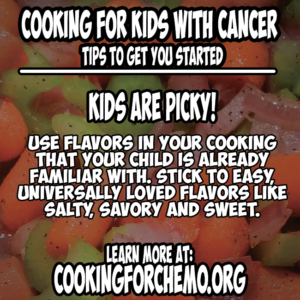 Cooking for kids undergoing cancer treatment poses its own unique set of challenges. These kids will have the same side effects that adults will have but they have the unique challenges of limited experience, limited understanding, and limited ability to properly express themselves, especially when it comes to food. I am going to share with you some tips, techniques, and ideas that will guide you to help make a difference when it comes to your child eating. Just like with everything else involved in raising your child, the best way to do anything with them is to engage them. In this sense, I am going to ask you to be very hands on and highly involved in helping them to learn, understand, and communicate their needs to you when it comes to their eating experience. The good news is that eating is fun! This will help with the first technique that I am going to teach you. The first thing you want to do is begin to discuss what foods, flavors, and seasonings that they ARE enjoying. From this you can begin to build a list of foods that they enjoy and using my roundness of flavor technique, you can begin to deconstruct these foods and discover what flavors are really work to help get them to eat. (IE: salty, savory, spicy, sour, and sweet) What I would advise you to do is to begin this process by talking to them every time that they eat. Does this food feel OK in your mouth? How does your tummy feel after eating this food? Anything that you can do to encourage your child to be honest, candid, and forthcoming with information is best. Just like colors, shapes, and letters, the best way to learn something is through repetitive exposure, discussion, and review. You would never expect a 5 year old to be able to identify the color teal unless you had previously exposed discussed and reviewed the information previously. It is the exactly the same with eating and flavors. 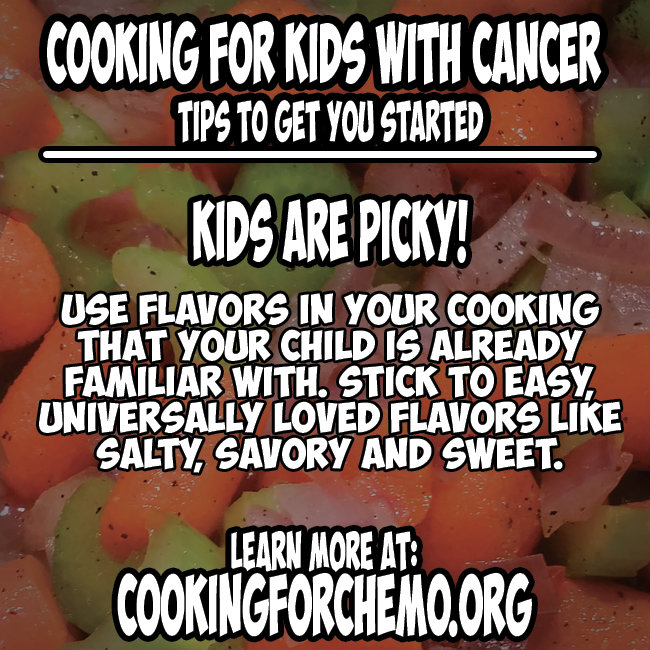 The biggest hurdle with cooking for kids fighting cancer is a limited ability to express how they are feeling. This can be easily remedied by repeatedly exposing them to different flavors, seasonings, foods, and smells. I am going to teach you how to play a fun game that will help your child overcome these hurdles and let you both have a lot of fun in the process. The Flavor Game is very simple. We start with the basic flavors and their at home analogs. Get 5 small containers and place salt, soy sauce, black pepper, lemon or lime juice, and sugar in the last. Have your child taste each one and try to guess what the flavor is if they don’t get it right, correct them, and have them try again. Then, while you are doing this, you can ask them if they like this flavor or not. This will help you correct your cooking for their preferences. I recommend that you play this game until they understand what each basic flavor is. Then, I recommend expanding the game to include other herbs, spices, food items, and ingredients. Playing this game will help them and you to understand flavors, smells, and how they all play together during the cooking and eating experience. The key here though, and this is very important, is to never ever tell the child or subtly suggest what they like or do not like. Even using phrases as harmless as “you like that, don’t you?” Or “Oh, I know you don’t like that.” Those types of phrases can lead a child to misrepresent what they actually like in the pursuit of pleasing their parent. Remember! When we are cooking for anyone going through cancer treatments, we are always cooking for their preferences, not ours. Even though your child may say that they really enjoy eating something, the true test is whether or not they actually eat it. Learn to observe what foods your child can eat a lot of and what items subconsciously refuse or avoid. If you combine this with the understandings of their preferences, you will be able to design meals that they absolutely love and enjoy. Now that you have all this great information and your child is able to give you quality feedback on their food and flavor preferences, we need a way to capture this information for later use. The best way to do this is by creating a food or tasting journal. This can be as simple as a yellow legal pad where you write down your child’s reactions to different foods, flavors, smells, and seasonings. Or, it can be as professional as purchasing a copy of my tasting journal, Chef Ryan Callahan’s Tasting Journal. Keeping track of this information gives you a tangible set of evidence that you can refer to at any time and this will allow you to justify decisions that you make when you are making meals for your child. Remember, we want to understand the flavors. Learn to communicate the things that your child enjoys, and keep a daily log of this information so that we can be properly equipped to handle any eating related cancer treatment side effects. For more information on Roundness of Flavor and how to combat specific cancer treatment eating related side effects, please read the other articles contained on this website. 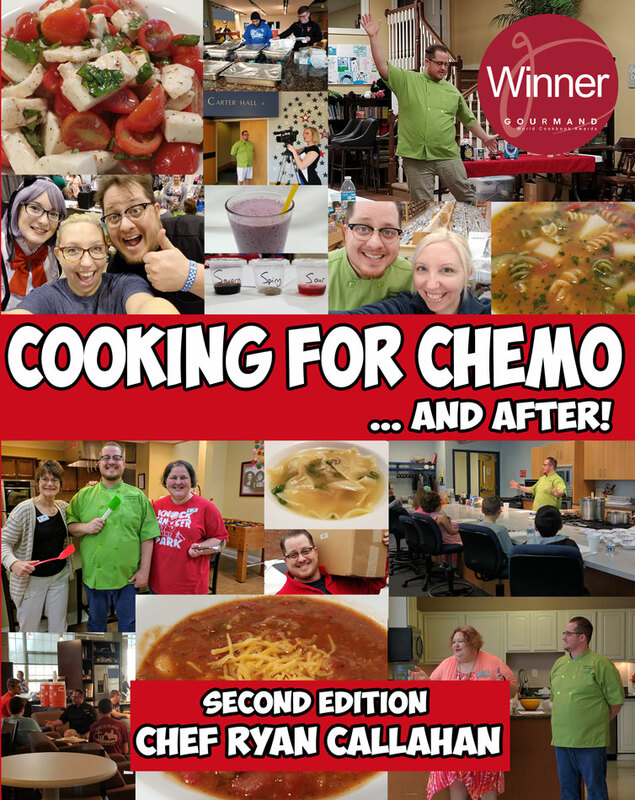 You can also purchase a copy of my newest book, Cooking for Kids with Cancer from Amazon by CLICKING HERE.